Learnings from our workshop on 15 November, 2018 at SAGCC in Johannesburg, South Africa. How does the VUCA world (volatile – uncertain – complex – ambiguous) impact leadership and collaboration? How can we transform from traditional leadership to agile leadership? What are the new leadership behaviors we need? What does all this mean for new ways of working in teams? in order to do justice to digital requirements and developments. Organizations need to implement agile structures, methods, and teams. We are happy to also discuss this framework with you in a conversation. Pat Roberts builds the bridge for SA clients, especially for German Expats in SA. She is a Senior Coach, serving SA clients on business and intercultural coaching. 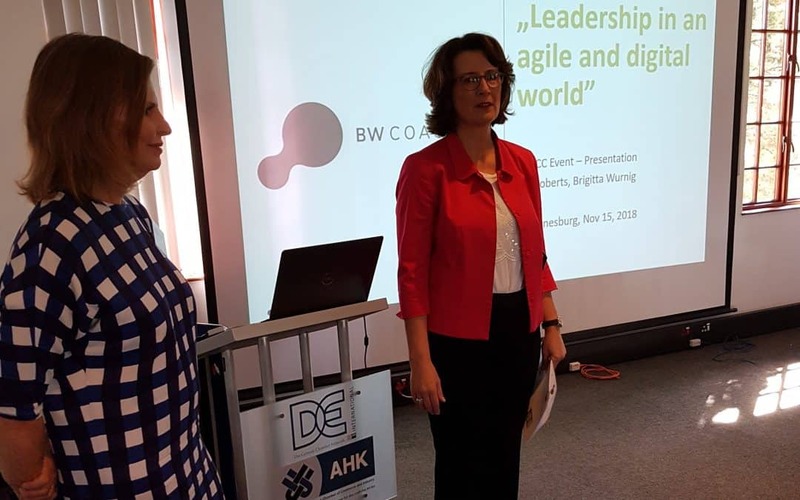 Brigitta Wurnig is the CEO of BW Coaching as well as the author of “Auf dem Weg: Erfahrungen mit Digital Leadership”.